We just learned about the Radioulnar ligaments that connect the forearm bones. Another set of ligaments is the Carpal Ligaments, that connect the radius and ulna to the carpal bones in the wrist. There are six different ligaments, all named for where they are and what they connect. The bones are the radius, ulna and carpals. The places are "dorsal" back or top of the hand, "palmar" palm side of the hand, and "collateral" sides of the wrist. The veins on the bottom or palm side of your hand are called the Superficial Palmar Venous Arch. These veins are much smaller and can't really be seen from the skin, but they are right up along the arteries in the palm. We just learned about the Radial and Ulnar Veins in the forearm and wrist that bring deoxygenated blood back toward the heart. There are veins on the top or back of your hand, called the dorsal side, that stick out a lot, and are sometimes used by doctors when they need to put a needle into your veins. 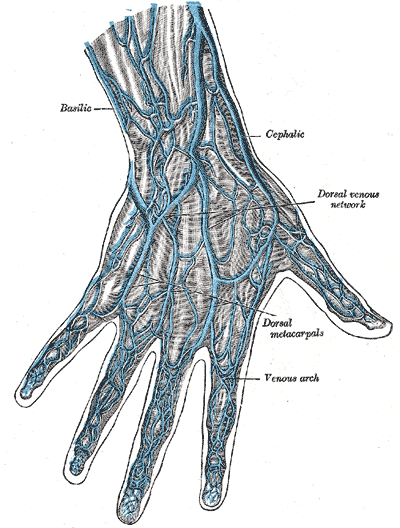 These large veins are called the dorsal venous network of the hand. The word dorsal means top, like the dorsal fin on top of a dolphin's back, so the dorsal veins are on the top or back of your hand. The palmar veins are by the palm of your hand. We know that the ulnar and radial arteries in the forearm lead to the palmar arch arteries in the palm of the hand. After that the arteries go into the palmar digital arteries. There are two palmar digital arteries, the common and proper. We know that the subclavian artery in the chest goes to the axillary artery in the armpit and then the brachial artery in the upper arm, then the ulnar and radial arteries in the forearm. After that the radial and ulnar arteries go to the deep palmar arch and the superficial palmar arch which both bring blood to your hand. The palmar interossei muscles in your hand are the muscles in between the metacarpal finger bones that are part of your hand. They are used to squeeze your fingers together. The dorsal interossei muscles in your hand are the muscles in between the metacarpal finger bones that are part of your hand. They are used to spread your fingers apart. The lumbrical muscles in your hand are the muscles in between the metacarpal finger bones that are part of your hand. They help you stick your fingers straight out. We just learned about the thenar muscle in the hand by the thumb. The other big muscle in your hand that you can feel is called the hypothenar. It's over on the side of your hand by your pinky, and it controls all the movement of your pinky finger. Just like the wrist muscles, there are many muscles in your hand that do different things. Let's start with the thenar muscle. The big muscle that's part of your thumb is called the thenar. It's responsible for all the movements of your thumb! The finger tip bones in your fingers are called the distal phalanges. There are only four of them in your hand, because your thumb has one less bone than the rest of your fingers. 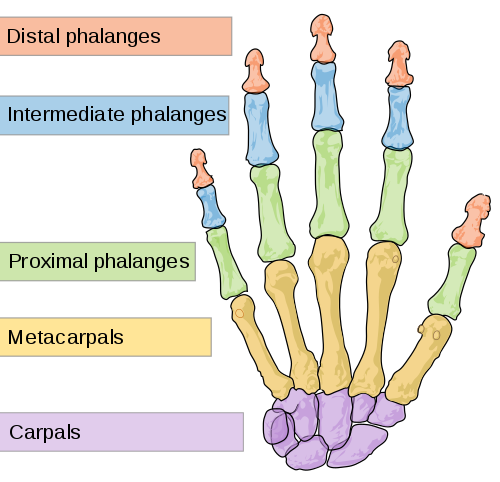 The first bones in your fingers closest to the main part of your hand are called the proximal phalanges. There are five of them numbered one through five, starting with your thumb bone and going toward your pinky. The bones in your hand are called your metacarpals. If you feel in your hand, you can feel the long thin bones going out toward each knuckle and finger. The metacarpal bones are numbered one through five, starting with your thumb bone and going toward your pinky. The bones in your wrist are called your carpals. You can't even really feel them all, but there are eight carpal bones in there! The bones have crazy names like scaphoid, lunate, triquetral, pisiform, trapezium, trapezoid, capitate and hamate.